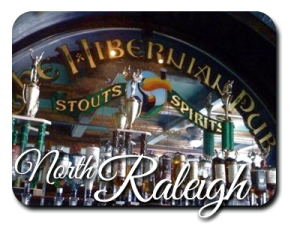 The North Raleigh Hibernian, located on Falls of the Neuse Rd., opened its doors in March of 2013 and just celebrated their one year anniversary! Following in the traditional Irish footprints of the other two locations, North Raleigh offers intimate, dark wood nooks to enjoy a delicious meal with friends and family. On chilly days, our fireplaces, paired with a pint or two, will be there to warm you up. The outdoor patio and bar are ideal for a quick lunch, happy hours with friends or dinners during the warmer months in North Carolina. Equipped with multiple bars and a delightful, friendly staff, we guarantee you’ll feel right at home here in North Raleigh. 8021 Falls of the Neuse Rd. The North Raleigh Hibernian location offers a fun and intimate atmosphere that would be perfect for a gathering of any sort. Whether you choose the outside patio, the spacious back room or anywhere in between, we can accommodate meetings or celebrations of any size. Hibernian proudly offers catering for any occasion, large or small! If you can’t make it into the pub, let us bring the pub to you! We offer full-service catering ranging from party platters and tailgating packages to replicating the traditional Irish Pub experience at your office or home. For more information regarding private events or catering, please contact 919-803-0290 or email info@hibernianco.com.